Alright, alright, I know these aren't books per se... However they certainly lived on the same shelves as my growing collection of Armadas, Fontanas, and Hainings, and judging by the huge impression these sets of cards made on a whole generation of kids, there is a good case to made for them being two seminal unbound books of horror. In the 1960s, an Austrian company named Piatnik began making a card game called Quartets, primarily aimed at the educational market. Now Piatnik had been - pardon the pun - a major player in the card world, forming as Wiener Spielkartenfabrik Ferd Piatnik & Sohne in 1824, and therefore knew a thing or two about art and game design. In this new game, there was a deck of 32 cards, divided into eight groups of four cards each, and the goal of the game was to collect as many complete quartets as possible. Now the rules of the game were very similar to that well-loved card game Go Fish, but Piatnik's innovation was to create themed decks and give every card statistics to use in play, with the idea being that young minds could absorb facts while playing with colourful cards with appealing art. Quartets provided to be very popular and soon various other manufacturers were producing their own ranges of decks, with minor variations on the Go Fish rules. 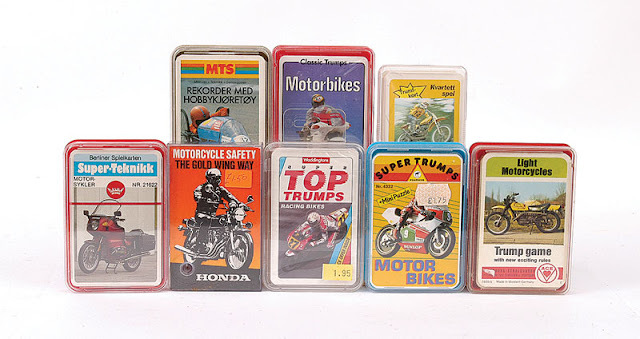 But by the early '70s, they also began expanding the scope of the themes, with a Germany company Alternburg-Stralsunder producing a variant series called Ace Trumps, aimed at appealing to boys, featuring a range of decks themed on military and transport vehicles. Now other companies such as Schmid and Dubreq were doing similar lines, but Alternburg-Stralsunder had introduced new rules that simplified and sped up play, with the goal now being to win as many cards as possible. Not to be out-done, Dubreq launched new ranges of cards with an even more streamlined ruleset, and the game of Top Trumps as we know it today was born. Launching in the UK in 1976/77 with a range of eleven different packs to collect and priced at 50p, comfortably in the pocket money range of most kids, Top Trumps became a genuine phenomena, with even adults enjoying the fun too. The game itself was simple to learn, easy to play, and involved the right mix of skill and luck. However soon the concept of collecting all the packs became a hobby in itself. Hence Dubreq were soon producing more and more decks, and as competitors and rivals began to hit the market, they began expanding the scope of their themes to appeal to a growing audience of players and collectors. And hence from the initial and profitable ranges focusing on vehicles, we soon had decks based on sports, history and animals, most of which largely held to the original ethos of Quartets in being factual, and therefore educational. However as Trumps mania burned bright and fierce, roaring across the UK, evidently the over worked deck creators lapsed into some frenzied fever dream, for in 1978 a new range was launched consisting of just two decks. And these two packs would become infamous - the Horror sets! Appropriately enough the origins of these decks are shrouded in mystery, and despite the best efforts of Top Trumps historians and the propensity of the internet to turn up even the most obscure nuggets of trivia, no one knows who devised these sets or who did the notorious artwork. And possibly that might be for very good reasons, for these two packs, known as Devil Priest and Dracula to trumpologists, are dubious in the extreme, not so much designed but more flung together by some gibbering madman. Now all top trumps cards had statistics on them which you matched against each other in play to win cards. And usually these were derived from solid factual things about the cards' subjects such as height, weight, top speed, age etc. (although in fairness I did think that many vehicular decks needed more abstract categories such as Unobtainabilty and Boredom Factor). Now obviously for the Horror decks, providing the usual factual/educational basis was a real challenge for the designers, apparently so much so that they ditched the entire concept and just made up their own nebulous categories. 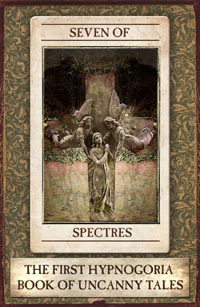 Hence each card gave its horror the following stats - Physical Strength, Fear Factor, Killing Power, and Horror Rating. 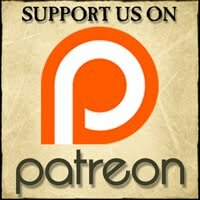 Not a bad basis for some horror trumps you might think, and many would agree. However unfortunately the nameless designers decided to just bung in any old numbers in these categories, seemingly without rhyme or reason, leading to infamous playground enigmas such as why did Death only have a Killing Power of 95? However the discrepancies in the stats paled into insignificance compared to the actual subjects on the cards. Now in fairness we do have reasonably faithful portraits of the big names in the horror world, with the likes of Dracula, Frankenstein, the Mummy and the Wolf Man getting semi-decent portraits albeit ones that appeared to be done in frenzied felt tip. But why is Godzilla wearing a tuxedo? Why is the abominable Dr Phibes purporting to be the Phantom of the Opera, while the famous Lon Chaney incarnation of the Phantom is moonlighting as 'the Hangman'? One might charitably assume that at some late stage it was realised that several horror icons and their images were under copyright and hence some desperate name changing was done. But then again, just who in the name of Hades are some of these characters? Where the hell is Zetan and why does it have a Warlord and a Priest? And what is the Norse god Thor doing in here, and more to point why does he have four eyes? Just how hallucinogenic were magic marker fumes back in the '70s? Even monster-obsessed and Top Trump addicted kids at the time knew that these were a shoddy piece of work, but despite their numerous, infamous failings, we loved these decks. Yes, the art looked like something that had been rushed out by a lunatic ten year old hopped up on sherbet dips and Alan Frank's Horror Movies in a single rainy break-time. And yes, it's true that most of us could honestly claim to know better artists in our own classes. 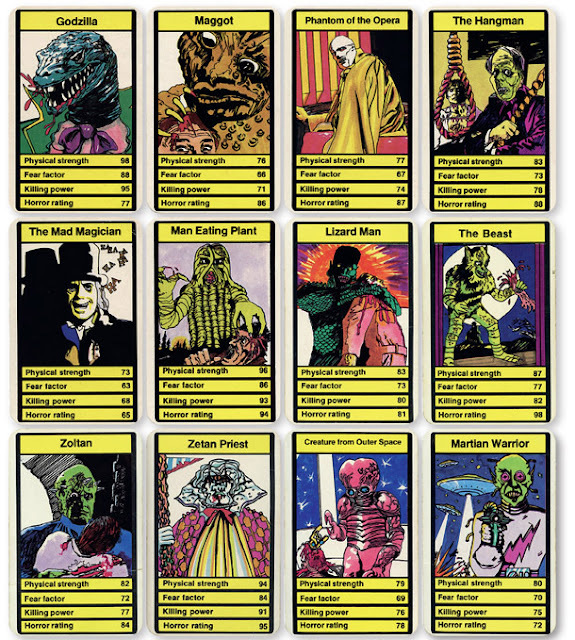 But despite the screaming crudity of the sets, these cards still cast a deep spell on the minds of a generation. While the artistic execution may have left much to be desired, the imagery had a manic energy, boldly mixing solid blacks with lurid colours, and attempting to be as horrible as possible with a gusto that bordered on unusually demented. And indeed horrible they were! In fact, I'm quite surprised that there wasn't a huge fuss and moral panic over these two decks. That might sound a bit far fetched, but consider this - I am very sure that you could not get away with selling a pack of cards called 'Devil Priest' to kids these days. And you certainly couldn't put a children's card game in the toyshops now that featured so many tortures, slayings and maimings, complete with severed limbs, spurting blood, and in one memorable case, shattered vetebratae. So then quite how there was never a huge outcry from self-appointed moral guardians back in the even more strait-laced '70s I'll never know. 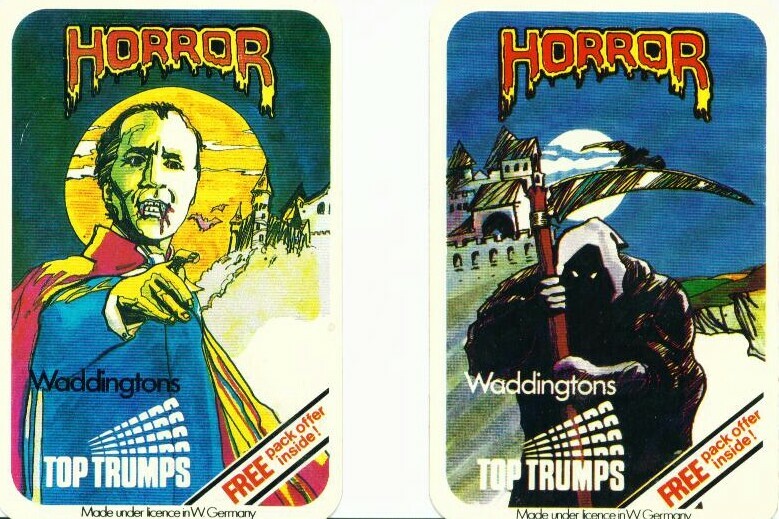 But certainly I think it's fair to say that Horror Top Trumps were much akin to the EC comics of the 50s or the video nasties of the '80s. They were the subject of playground rumour and it was a badge of honour to own a set. 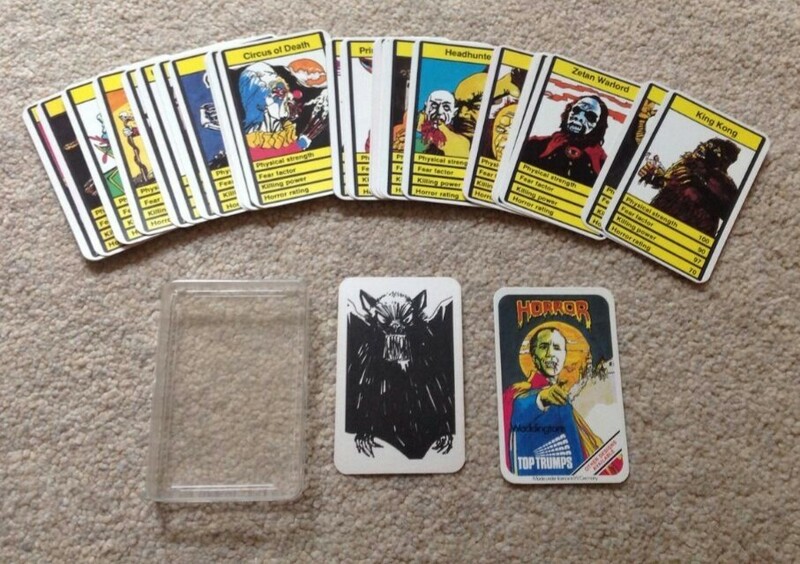 Horror Top trumps weren't so much played, but passed around like contraband - could you bear to gaze upon the bloody beheading in The Fiend? Brave the gruesome horrors of the Venusian Death Cell? Dare to ask again why is Godzilla wearing a fricking tuxedo? However despite the opiated nostalgic delights these decks bring us, they surprisingly still offer us a great game today... But I don't mean a round of Horror Top Trumps! Going to back the question of why some cards clearly have the wrong names on, looking through both decks now, it's very obvious that a large proportion of the art was heavily based on stills cribbed from assorted movies, hence Chaney's Phantom operating a gallows. But how many cards were sourced in this way? Where did our mysterious artist steal from? And was there actually a precedent for demented visions such as the Zetan Priest? Well, dear friends over the coming weeks we are going to unravel these mysteries in a new weekly series of articles - which I think I'll call the Tomb of the Trumps and hopeful reveal the secret origins of this iconic cards! The Mad Magician is definitely Lon Chaney, Sr again. From the equally fabled 'London After Midnight' (1927). I really enjoyed reading this post. I hadn't heard of these cards before but I love their bizarre colour-clashing luridness! Maybe Death only has 95 Killing Power because he gets points deducted for those of his victims who rise from the grave - such as all those vampires, mummies and, er...zoltans? Looking forward to more in this series!